The following is the Boxing Insider notebook for the week of August 30th to September 6th, covering the comings and goings in the sport of boxing that you might have missed. 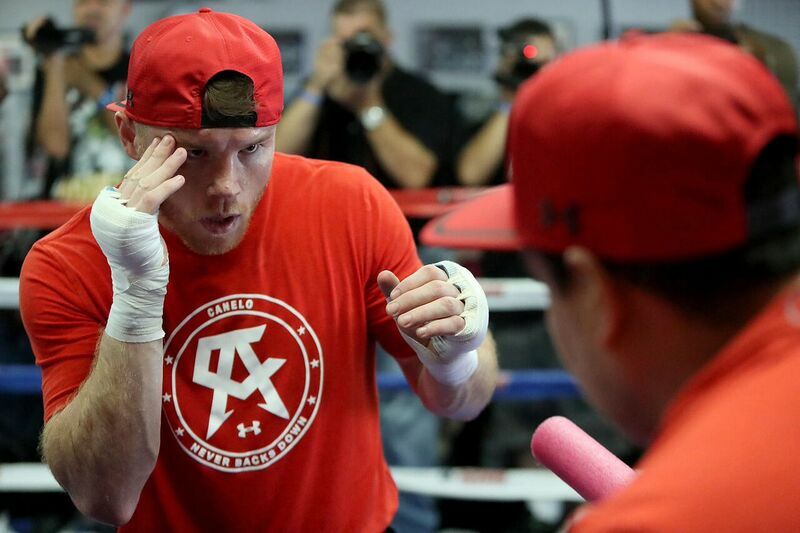 Canelo Alvarez recently worked out and spoke to the media in San Diego, ahead of his upcoming PPV fight with Liam Smith. Below are a few select quotes. “I love San Diego because it’s really calm here, which is something I require when I am in camp. I feel comfortable and at home which makes me feel great while training, and allows me to train at 100 percent. “People can have their opinions on the fight. We are training for a world title fight, which is worth respecting. We are doing the work and training hard. Winning this fight is the focus and everything else will come. “The climate here in San Diego is perfect for training. They have a great training environment here at the gym – we have the privacy and the space to run the distance and that makes us very happy. We are enthusiastic with our training efforts, and are working hard to get another title. We are content with the way training is going, and we are looking forward to showing the fans what we have been working on. One of the most anticipated bouts in boxing will take place on Saturday afternoon, September 24th as Anthony Crolla and Jorge Linares will square off for the WBA/WBC Diamond/Ring Magazine Lightweight championship that will be televised LIVE on AWE-A WEALTH OF ENTERTAINMENT. “We are thrilled to be able to show this major bout. This is for the lightweight championship of the world and we have two great champions willing to put it on the line. This fight is for supremacy and the fans will see a great fight on September 24,”said AWE President, Charles Herring. What are your thoughts on Dusty Hernandez-Harrison? You started out at middleweight, but you have eased your way down to welterweight. How difficult has that been and what type of advantage does this play into the September 15fight? The fourth edition of “Battle Born Boxing” returns this Thursday night (June 9), starting at 7 p.m. PT, at the outdoor Downtown Las Vegas Events Center. “Battle Born Boxing” is an amateur boxing series created by Neon Star Media on behalf of its client, the D Las Vegas, to support amateur boxing in Nevada, as well as provide a platform for amateur boxers from other states to compete against local clubs and boxers. Las Vegas-based boxing clubs represented at “Battle Born Boxing: Uprising IV” includes Barry’s Boxing, Richard Steel Boxing Club and Johnny Tocco’s Ringside Boxing. “Battle Born Boxing” was successfully launched April 15 and the amateur boxing series will continue the night before each of the “Knockout Night at the D” series professional boxing events, airing throughout 2016 on CBS Sports Network, live from the DLVEC. “Battle Born Boxing: Uprising IV” tickets, priced at $15.00 for ringside (rows 1 and 2) and $10.00 for general admission, are on sale at www.DLVEC.com. International Championship Boxing League (ICBL) Founder and CEO, Jack Perone Fulton, wishes to thank all involved with making the inaugural Azteca Open event a tremendous success. Held this past Saturday, September 3, in Aguascalientes, Mexico, in association with promoter Bernie Valenzula of BBB Promotions, the ICBL Azteca Open featured 21 bouts with a considerable number of these fighters looking to earn a spot in the ICBL 2017 inaugural season. In the night’s main event, a WBC Latino Silver Title eliminator, Ontario, California’s John “Bang Bang” Delperdang scored an eight-round majority decision over hometown favorite Oscar “Totti” Mejia. Behind after the first three rounds, Delperdang (8-1, 7 KOs) eventually wore down Mejia (8-1-1, 3 KOs) with punishing blows to the body and head, leading to a cut above Mejia’s right eye. With the victory, Delperdang now holds the right to challenge the UK’s Lewis Ritson for his WBC Latino Silver Title. In other ICBL-significant action, 10-time world champion kickboxer turned professional boxer Tyrone “King of the Ring” Spong of Miami, Florida, (via Paramaribo, Suriname), scored his sixth straight stoppage victory (6-0, 6 KOs) with a one-punch third-round destruction of formerly undefeated Mexican heavyweight Hugo Leon (3-1, 3 KOs). Tickets are priced at $200 (Red Carpet), $100 (Ring Side), $75 (Palco), $40 (Preference), and $20 (General Admission), not including applicable service charges, and can be purchased at Ticketpop.com, Ticketpop locations (all Walmart stores at the Money Center counter and all Amigo Supermarkets at the Service counter), or by calling 787-294-0001 or toll free 1-866-994-0001. The fight promises crowd-pleasing, high-intensity action between two powerful fighters in an all Puerto Rican match. A fight in the making for 5 years, it promises fireworks, as it is widely known that there is a clear dislike and bitterness between the fighters. Both *Papito* and *JuanMa* have had illustrious careers and enjoy high levels of popularity in the Island. *“Guerra en el Clemente”* is shaping up to be one of the most anticipated fights in the Island for years. *Vázquez Jr. vs. López*, a 12-round fight, takes place Saturday, October 8th at the Roberto Clemente Coliseum in San Juan, Puerto Rico. The fight is presented by Black Tiger Promotions, in association with Matias Entertainment, and sponsored by Best Alarms and Municipio de San Juan. The event will be distributed live on Pay-Per-View in Puerto Rico and the United States beginning at 9:00 p.m. ET/6:00 p.m. PT. Split-T Management is pleased to announce the signing of the US National Elite Champion, Ardreal Holmes to an exclusive managerial contract. Holmes, 21 years-old of Flint, MI made his successful professional debut on August 27, 2016 when he stopped Rakim Johnson of Indianapolis, IN in the first round, in Detroit, MI. Holmes, who was the number-one ranked welterweight in the US, had an outstanding amateur career that culminated in reaching the finals of the Olympic trials. Holmes has competed in over 80 amateur fights and won several major tournaments including the 2015 USA National Elite Championship. Holmes also has competed in several major international tournaments. In March 2016, he competed in the World Series of Boxing and scored a sensational knockout over Cyrus Patterson of Great Britain.